On Halloween I marched through London with hundreds of women. Many were dressed in ghoulish costumes. Eyes and mouths were daubed with fake blood; plastic axes buried in headbands atop grey-dusted heads. Liberal amounts of toilet paper bandages fluttered in the wind. 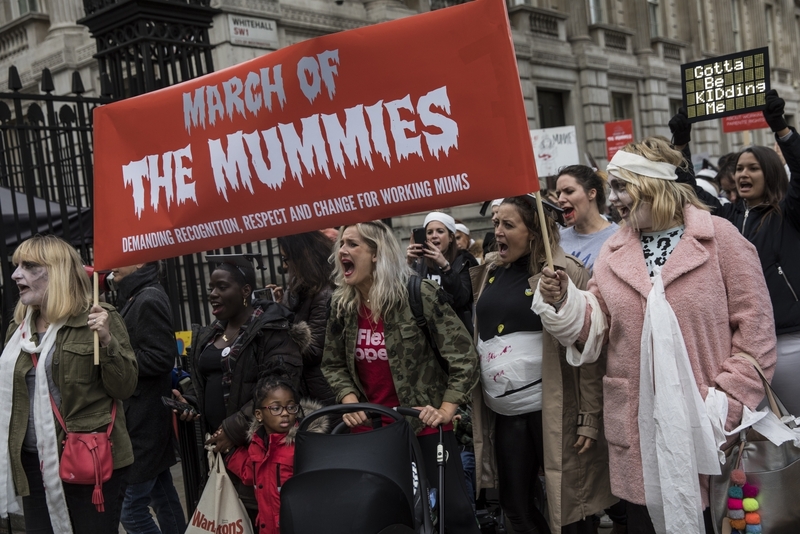 Phones beeped and chattered with news coming in from Glasgow, Belfast, Cardiff and Manchester, where hundreds more were joining the March of the Mummies. It was a terrifyingly glorious event. Glorious because I do love a good march with women and the liberation of shouting aloud our demands: To yell your deepest need at the top of your voice when for all your life you are encouraged to be quiet is exhilarating. Terrifying because we have been shouting for so very long now and yet still, ending the inequality that women experience – so much of which is embedded in attitudes to motherhood – seems to be beyond the capacity of the old political parties. Our procession wound through Whitehall and down to the Commons and as I stood up to speak before the rally I wondered how many behind the golden stone walls of the Houses of Parliament were paying us any attention – embroiled as MPs are right now in the storm of recriminations over sexual harassment and abuse. And yet, if they’d only looked out of their mullioned windows, they would have seen and heard the answer to their problems. Every word I spoke was an answer to the issue that has been so heatedly discussed for days now without us getting anywhere near to the heart of it. Westminster isn’t well – it even looks sickly from the outside these days, part-wrapped in plastic and propped up by scaffolding and support beams. Politicians’ responses to the claims that many among them have abused, harassed and committed sexual violence against women of their institution sound sickly and feeble. There is an opportunity amid the turbulence of these days to seize upon the opportunity it creates and restore the health of our democracy. But we can only do it if we understand what medicine is required. One of the things I have been most frequently asked in the last week or so is whether I am surprised by the allegations in Westminster. I have to say, I’m not surprised at all. Last year, the Women’s Equality Party ran a campaign called #WECount, which aimed to highlight the extent of sexual harassment. We set up a website where women could mark the postcode of where they had been harassed or assaulted. It was an project to show the scale of the problem across the UK and to stop it being brushed under the carpet. Women shared photographs on social media of the palms of their hands with the postcode of their assault written on them. A significant number of them had written SW1 0AA – the Palace of Westminster. We’ve seen since the Harvey Weinstein story broke how endemic sexual abuse and harassment is in the media and entertainment industries. That politics is also riven by such awful behaviour does not come as a surprise, not just because our campaign demonstrated it long before today’s scandal. All three of these institutions contribute to that epidemic because their actions and output shape our society and because all three institutions are dominated by men, creating images, telling stories and writing legislation that prioritises the male experience, furthering discrimination against women and further tipping the balance of power in men’s favour. Don’t get me wrong: We have to support survivors of violence and we have to support women to report violence against them. It is abundantly clear that Westminster has little or no HR functions and that the shaky reporting systems in place are woefully inadequate – politically flawed, practically useless. The institution and all parties must put in place independent, third-party reporting systems so that women do not have to tell their stories to superiors or line managers or political allies of the men who have groped and assaulted them. Safeguarding training for all staff is needed. As is a formal policy on dealing with sexual harassment. Equally, I believe that women coming forward to tell their stories is incredibly powerful and can change the way we work and work together. I hold no truck with those from a previous generation of so-called feminists who have come forward to tell women to toughen up and brush harassment off. Great that you felt able to brush it off. That didn’t stop it, or help us. And if you want to talk about being tough – well frankly I know of nothing tougher than speaking up against someone who has humiliated, belittled and assaulted you. I have nothing but huge respect and thanks to every woman who has stepped out to tell her story. This problem is systemic. And so for society to expect women to solve it by speaking out, or politicians to believe they can solve it by better HR – well, it demonstrates why we are here in the first place. Women are harassed and abused and assaulted because men have more power than them. That’s it. The only way to stop this from happening is for women to share power equally with men. 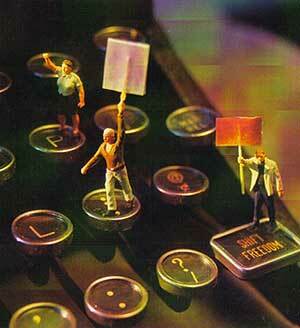 And the only way to make that happen is to do the painstaking hard work of demolishing barriers to equal opportunity. This will disappoint the people who want a silver bullet. But lots of hard work doesn’t mean it’s not doable. It’s entirely doable. It’s just a matter of political will. The other parties don’t have the political will to put this at the top of their agendas. That’s why the Women’s Equality Party formed. I was a founding member, and I stepped away from my previous job, from my previous political loyalties, from my expectations that someone somewhere would finally do something about this – because the realisation that no-one is coming to do this is actually all the liberation that we need to do it ourselves. Or we can act now to get more women into more positions of power and to get men to share the care work that women do – the silent, painstaking work that underpins our economy yet pushes women out of the workplace and limits our our financial autonomy. The motherhood penalty is the single biggest driver for gender inequality because it limits women’s wealth, status and freedoms. One in nine pregnant women are pushed out of their jobs and 77% of them face discrimination. More than half of working mothers reduce their hours, while less than a third of fathers do the same. Women face a two percent drop in wages for every year they are out of work, caring for their children. And the motherhood penalty doesn’t just penalise mothers: forty per cent of employers will avoid hiring a woman of childbearing age. The result is that women are more likely to be in positions with lower salaries and less chance of promotion. The occupations and industries where women dominate have lower status and pay. The gender pay gap, already an eye watering 18%, is reducing at the slowest rate in years. These systemic inequalities not only create the context for harassment; they also make the task of calling out the abuse all the harder. A member approached me in the wake of the Weinstein allegations to tell me that her colleague had been getting away with the same thing for years. When I asked her if she planned on reporting him, she said that she was worried that her pregnancy already made her more vulnerable to the latest round of redundancies at work and she couldn’t afford to lose her job. The Women’s Equality Party – the UK’s first feminist political party – is pushing to fix our lopsided economy and fraying society and in so doing end the imbalance of power that causes this plague of violence and abuse that blights us all. Childcare and shared parenting might not seem like the most obvious solution to sexual violence and harassment, but it would transform and rebalance our economy and society. That is why in the 2017 General Election, the Women’s Equality Party offered 40 hours free childcare a week from the end of parental leave right through to school. It is why we offered three months parental leave to each parent at 90 percent of pay, and a further three months to allocate between them. These were some of the biggest ideas on offer in that election. Free childcare is an economic driver that would deliver twice the number of jobs compared to the same investment in construction. It would revolutionise workplaces not only for women who have children but all women, and for the men who are being pushed out of family life just as women are pushed out of work. Women have been discriminated against for nearly all of this country’s history. Denied the right to vote or own property until the 1920s, women have struggled to amass wealth, representation and rights. The laws may have changed but that history is not yet past. Valuing care and putting it at the heart of a legislative agenda would build a fairer future. Equal pay and equal opportunity to work would build a fairer country. Equal representation in parliament and business and in the media would ensure that fairer decisions that reflect all our lives. An education system that teaches the importance of gender equality would end the unfair occupational segregation of our children that values men’s work above women’s. All of these ideas are in our party’s manifesto and we delivered that manifesto to all of the other parties during the last election because we want them to listen to us and beat us to it. Jeremy Corbyn may talk about equality but so long as his party prioritises industrial strategy more than Sure Start and social care, his policies will still leave women at the bottom of the list. Theresa May cannot talk about seeking to end this abuse of power while pushing through an austerity policy that hurts women more than men because of their disproportionate dependence on state benefits. She cannot push through Universal Credit that will removes those benefits from single parents whose access to work is blocked by unaffordable childcare. It’s time to stop asking for equality. We got the vote a hundred years ago. Now let’s use it to vote for our equality. I sensed that Caroline Lucas was holding back in her 2015 book Honourable Friends? Parliament and the Fight for Change, where she does highlight sexist abuse in Parliament. Such insider views suggest that the status quo is something swanlike: appearance of tranquility belying a flurry of reactionary activity to preserve ancient and often foul practices in the face of reformist threats. However, the call for a Women’s Equality Party will still encounter opposition from tactical supporters of electoral reform towards a system of more-proportional voting that will accord smaller parties more representation in Parliament. And that would also open the door for more reactionary parties. Still, I would prefer to see these issues robustly debated in public forums than swept beneath the carpet, as seems to have happened in a such a culture-shaming scope. The corruptive influence of Parliament has a habit of taking the fangs out of grassroots movements: transparency is key, particularly if negotiating with other parties considering adopting some of your platform.